The airport's unguarded paid parking areas have sufficient capacity for parking your car. There are separate car parks for both short stay and long stay parking. If you have any suggestions on how to improve our parking arrangements, let us know using the feedback form. The Tallinn Airport parking house is open. 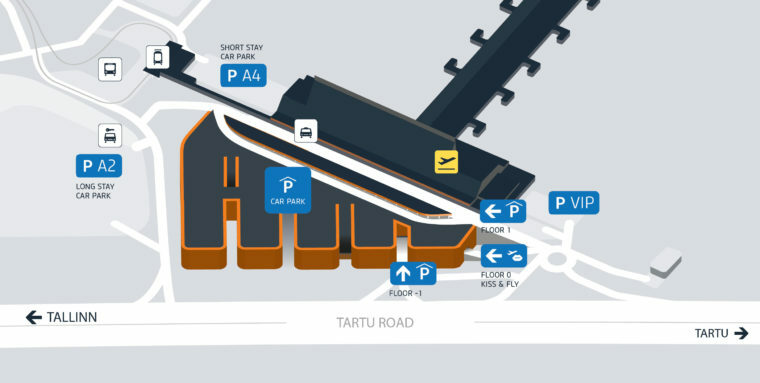 The new parking house is located next to the Tartu road on three levels with five interconnected car parks and enables fast and convenient parking whether you are going on a flight or picking up your family. Separate entrances and exits on all levels. Service and waiting area in front of the terminal for contractual taxis only. Short-term “Kiss & Fly” parking zone on the second level. The rates for the parking house can be found HERE. The parking calculator will help you calculate the parking fee. Car parks are open 24 hours a day. ‘Kiss & Fly’ parking area is open on the second level inside the parking house. This parking area is the most convenient way to send your family off to the flight or pick them up, instead. The first 15 minutes of stay in the parking area are free. Please make sure to view the traffic scheme beforehand and consider with the height limitations inside the parking house(2.4 m). The ‘Kiss & Fly’ car park is meant for short-term parking. It is especially convenient if someone is picking you up or dropping you off at the airport. Parking is free for 15 minutes, after which a fee will be charged at the applicable rates. The rates for the ‘Kiss & Fly’ car park can be found HERE. Long stay car park (car park A2). If you’re going to be away for a longer time, you should park your car in the airport’s long stay car park. The car park is a short walk from the terminal. The rates for the long stay car park (A2) can be found HERE. Short stay car park (car park A4). If you’re going on a short trip or come to the airport to drop someone off or pick someone up, it is convenient to park in car park A4. The parking lot is located in the immediate vicinity of the passenger terminal, next to the tram and bus stops. Parking is free for 15 minutes, after which a fee will be charged at the applicable rates. The rates for short stay car park (A4) can be found HERE. Parking for people with disabilities. Disabled passengers can use parking places for short-term (2 hours) car park A2 or in the parking house. If taking a longer trip, you will be charged according to parking house, A2 or A4 car park price list. There is no parking for disabled passengers in temporary Kiss&Fly car park (A3), access to passenger terminal from short-term car park is impaired and therefore no suitable for disabled passengers. Payment machines at passenger terminal arrival area. Payment machines next to the entrances and exits of different levels of the parking house. Main floor of arrival area at parking. Payment machines located in the pavilion in middle of A2 car park. Pay with your mobile phone! To make a mobile phone payment, dial the phone number printed on the parking ticket or use the new Pargi.ee app. Choose the “Lennujaam” parking zone and enter the parking ticket number. 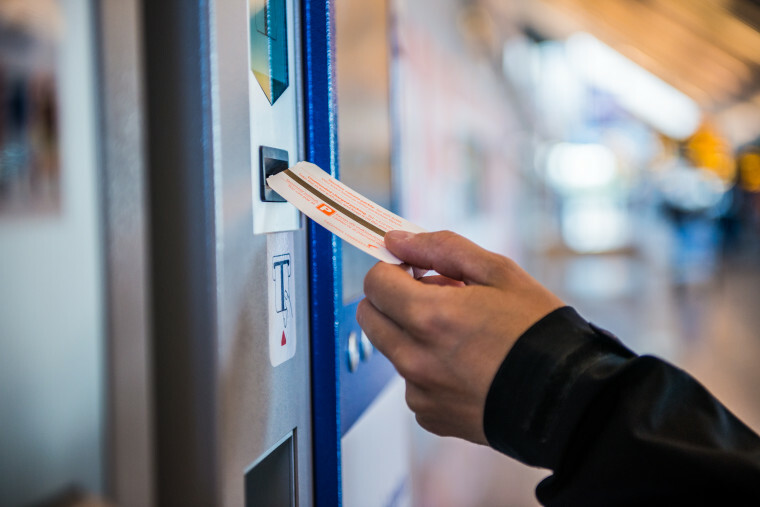 To pay for the Tallinn Airport paper parking ticket with your mobile phone, enter the following combination: 1312*445*TICKETNUMBER. The ticket number is printed on the front side. The parking fee will be added to your next month’s mobile services bill. To raise the barrier when exiting the car park, insert in the slot the parking ticket you previously received after payment. If a payment terminal is inoperable, call the number 605 8288. The parking house as well as all other parking areas of the airport are meant only for passenger cars and motorcycles. The price for parking motorcycles is the same as for passenger cars. When entering the Parking Station, make sure that your vehicle’s height does not exceed 2.4 metres. If your vehicle is higher, proceed either to the open third level of the parking house or to the A2 or A4 car park. Read the terms and conditions of parking here. Jump-start service is available in the airport car parks by calling the number 605 8288; the fee for one jump-start is 8 EUR.